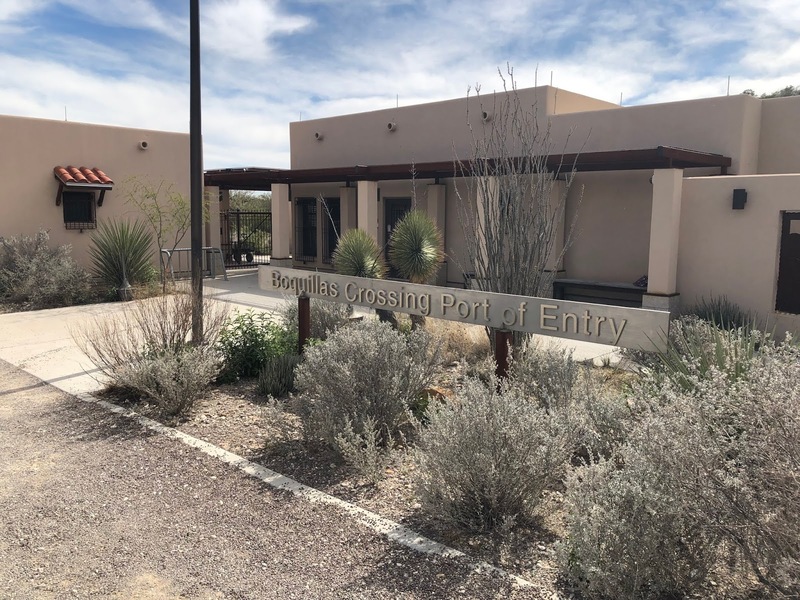 U. S. Port of Entry at Boquillas Crossing. Great Bend National Park. The crossing is open during daytime hours and only certain days of the week. You must be back by 5:00 when this border officially closes. It is staffed by an armed Park Ranger. He was very helpful with our first time crossing and in getting our passports checked when returning, another interesting process. When returning, you place your passport under a scanner which is viewed by a border patrol agent in El Paso. You’re instructed to pick up the phone handset next to the scanner which connects you with the agent viewing at your passport. A camera allows the agent is see you. It seemed to work well. 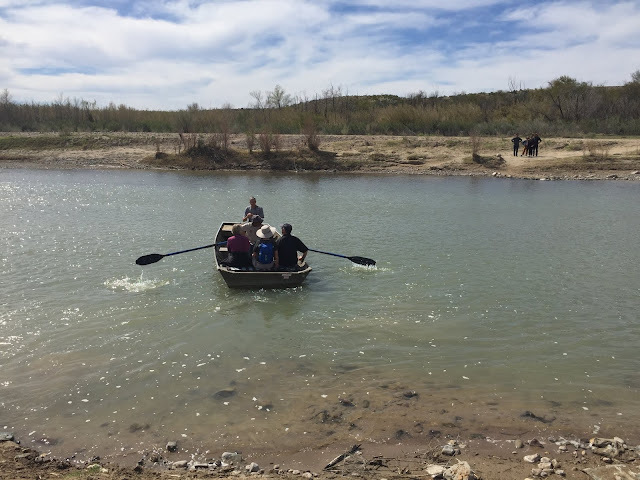 A small rowboat takes tourists back and forth during the hours the border is officially open. After getting off the boat, it's a short hike up a dirt path to the U.S. Port of Entry building. 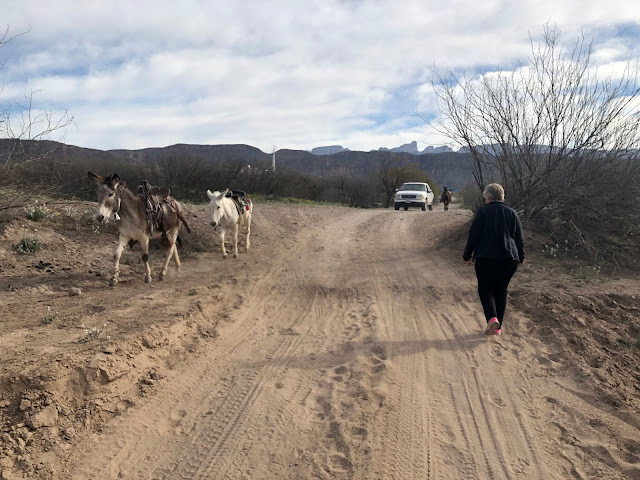 Once in Mexico, it's about a mile into town. You can pay to ride a burro, a horse, ride in a truck or walk. 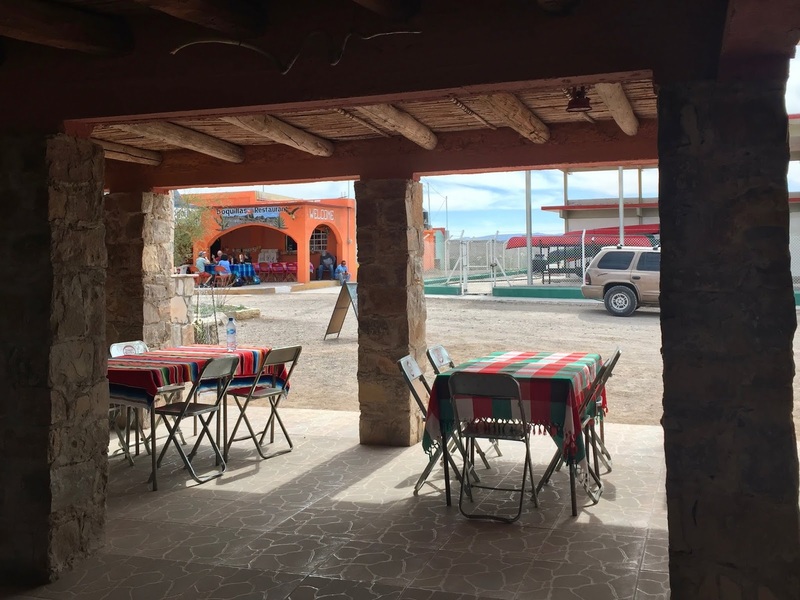 Men from Boquillas offer to take visitors around town, a tour guide of sorts, they work for tips. The people were very welcoming and low key. 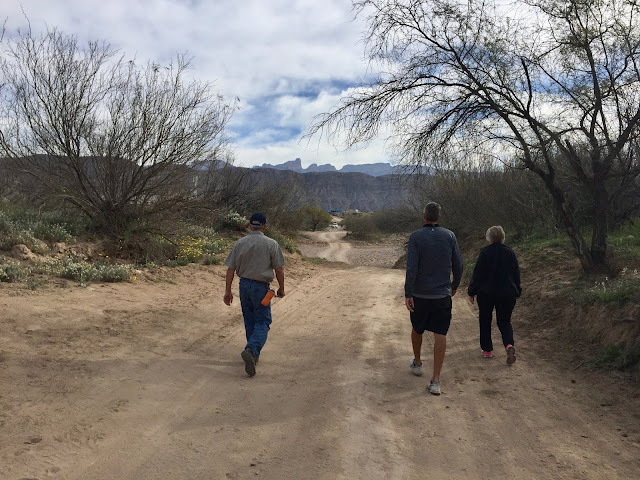 We opted to walk, we thoroughly enjoyed the walking and being able to take our time. Next time (and I hope there is) it would be fun to have a guide, I'm sure we'd learn more and have somebody answer our many questions. Some residents we talked to were semi fluent in English, others not so much. nobody leading them, apparently they knew the routine. (I think the driver in the white truck was keeping an eye on them). We went with another couple that were camping next to us. Really fun people, we had a great day. 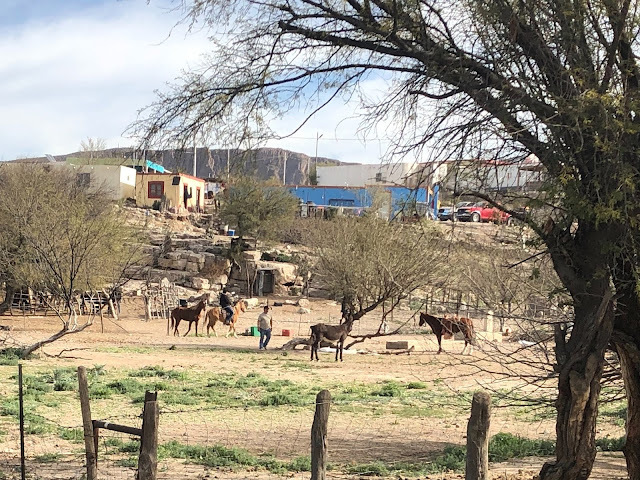 The village was originally founded as a mining town in the early 1900’s, mining ceased in 1919 at which time the population greatly declined. 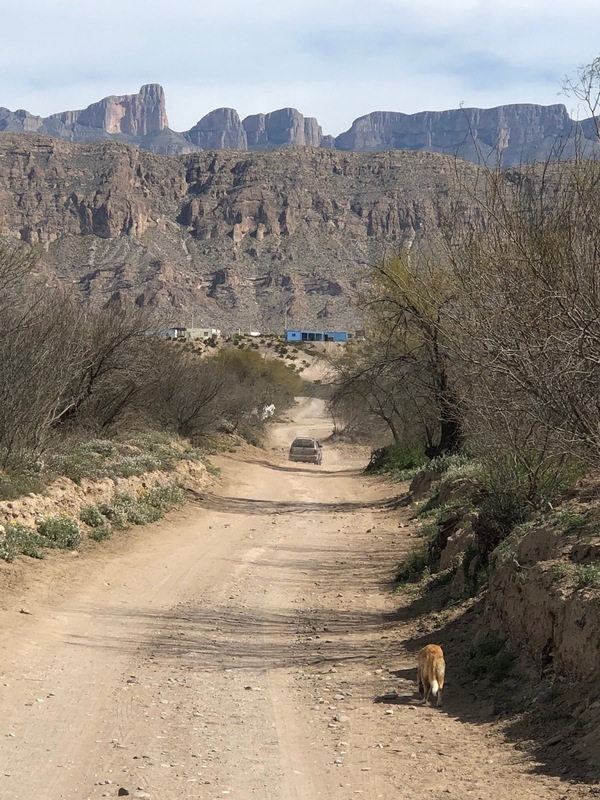 It’s incredible to me that this village even survived, the nearest town is 160 miles away over a dirt road, these people are isolated, living in their own world. 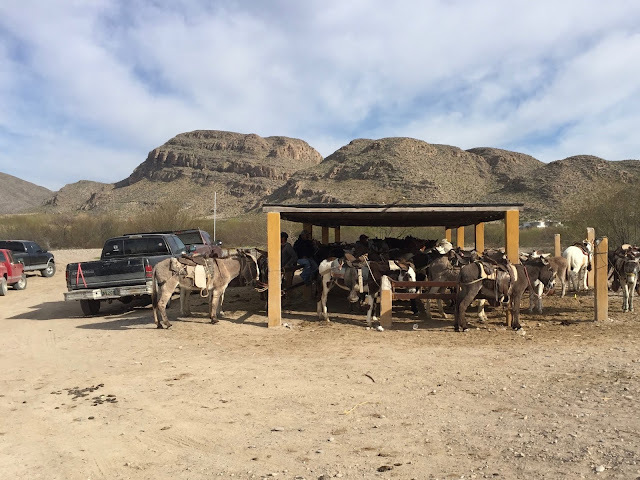 Approximately 300 residents still make Boquillas their home. 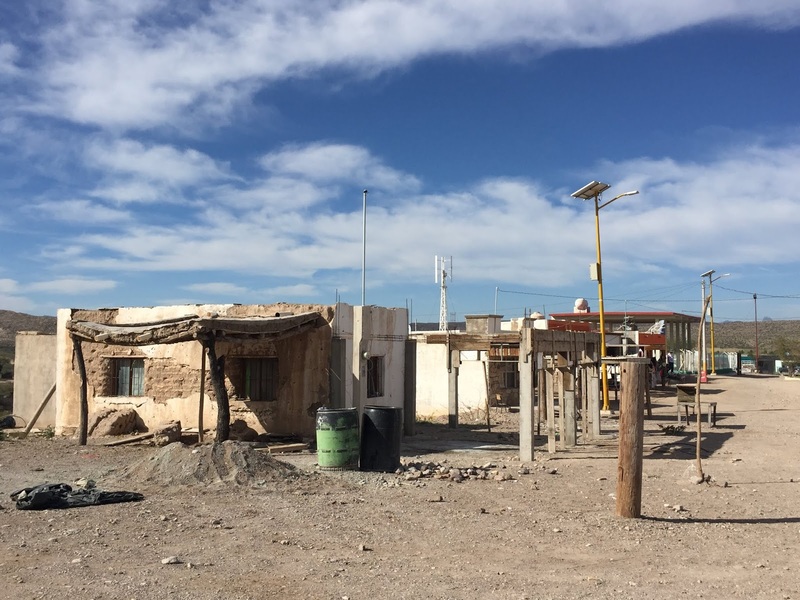 They have a school and a medical clinic where a doctor makes scheduled visits. A solar power station was installed in 2015, up until that time there was no electricity in the village. On the edge of town. We had lunch at one of only two restaurants. Food, service, cleanliness...all wonderful, totally surpassed expectations. The Boquillas people are very happy to have the tourists visit, it's their main source of income. They are very friendly and welcoming all in a good way. It didn't feel at all like a remember my visit to Nogales years ago. Informaiton sign in English and Spanish when entering the town. Items for sale are displayed outside villagers homes. This is the only store we saw, it also serves as a home. The needlework is beautifully stitched with colorful threads and beads. I'm not sure what is sold in this store, I think it was more for villiagers. This was such an interesting day for us. We couldn't help but think how fortunate we are to be born in the U.S. We have so much, so much of everything...food, gadgets, clothes, do-dads, toys, stores, choices of medical care, schools, recreation. Sometimes it's the luck of the draw where you were born that defines your life. A few villagers cross the river (illegally) and place trinkets on rocks along hiking trails close to the river. A plastic bottle next to the souvenirs asks tourists to leave money for whatever souvenirs they take. It’s an honor system, although many times you’re being watched from vantage points across the river. 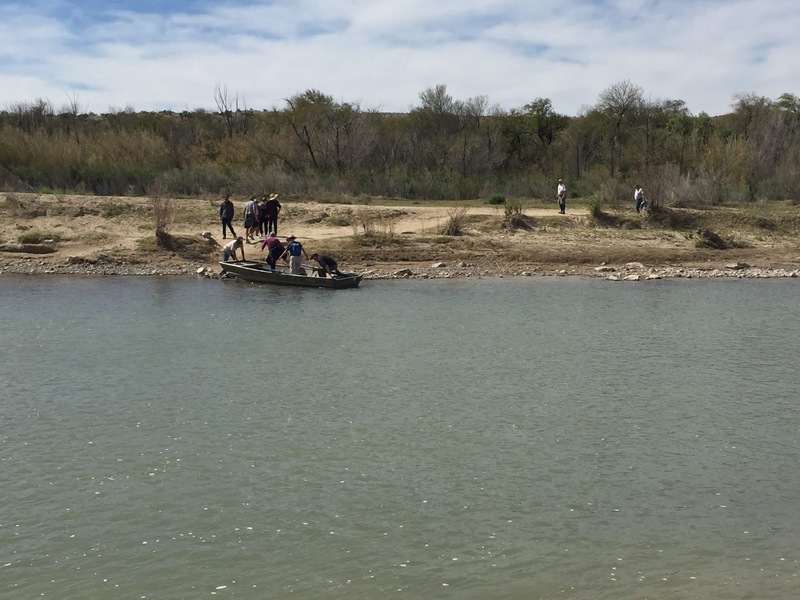 It is technically an illegal crossing, they only stay long enough to put out their trinkets and collect the money. We watched them make quick trips across the river, by canoe or horses. 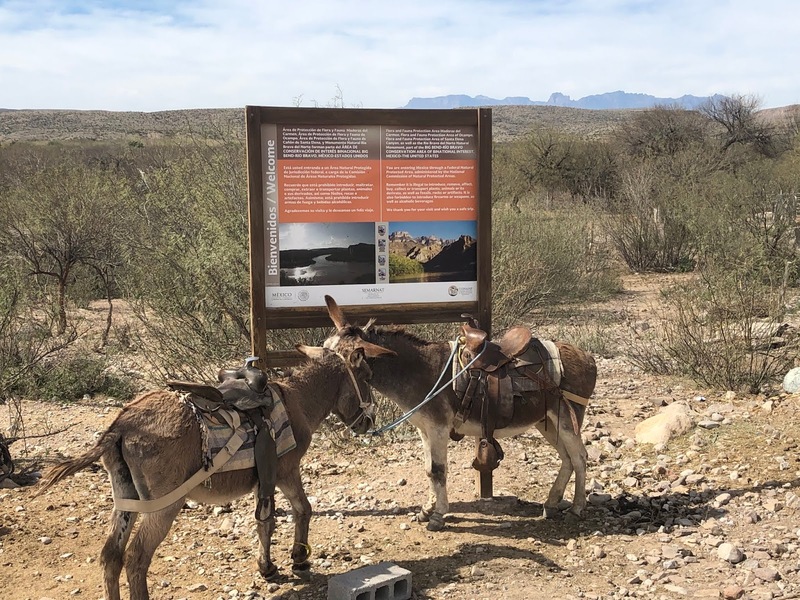 The Park Rangers don’t do much about it unless it gets to be a problem. 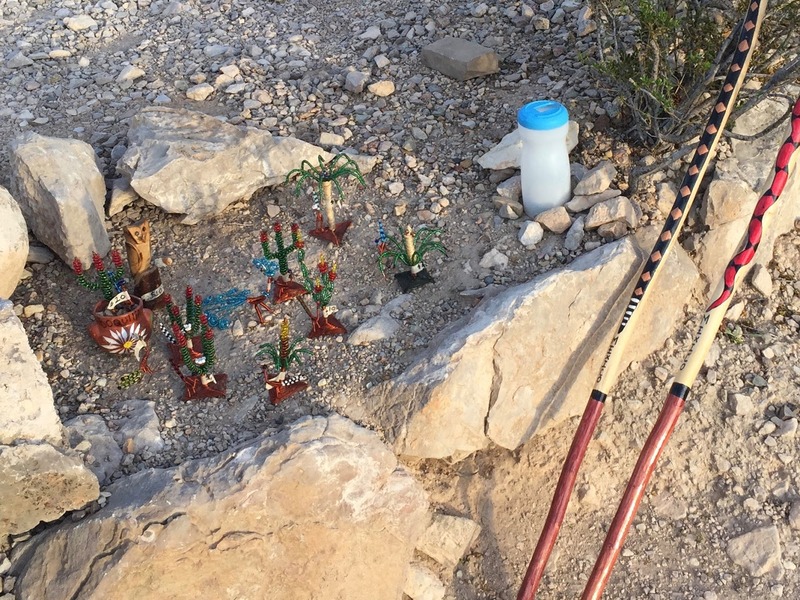 However, the park newspaper states not to buy these items because they’re illegal and considered contraband that can be confiscated by officials. 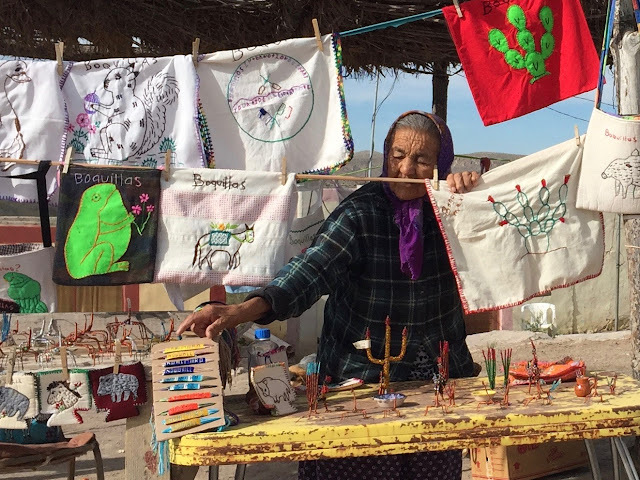 It’s best to support the people in Boquillas by buying items in their village from people who are following the rules. Boquillas villager keeping an eye on his trinket stash. 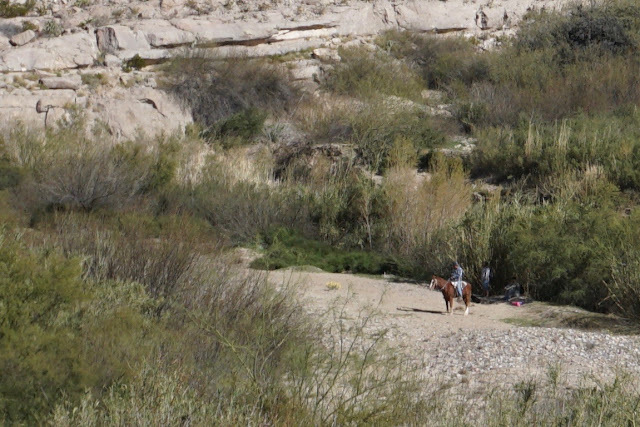 I shot this photo with a telephoto lens, the river is below me, the horse is on the Mexican side of the river. Great Bend National Park has been a great visit, the Blue Bonnets were blooming, the roadsides filled with fragrant flowers. There's high enough mountains here that on a couple hikes we were in pine trees, we even came across deer and a black bear, who would've thought??? Not us.